The central coastal location of Vrissiana Beach Hotel is ideal for a family getaway, putting you within reach of a fantastic array of things to see and do in Protaras. Your stay at Vrissiana Beach Hotel will be relaxing, comfortable and well-catered. Rooms and suites are well decorated and furnished, equipped with essential amenities for a great stay. The hotel restaurant treats guests to both great Mexican food and al fresco dining which overlooks the Mediterranean Sea. 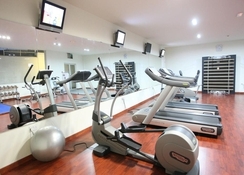 The hotel has a gym and tennis court for those who want to stay active and a spa for when you want to slow down, take it easy and unwind. Protaras has no shortage of great places to wine and dine. Take your pick from an amalgam of global dishes, from fine local Mediterranean seafood to international favourites like Italian and Chinese. Spend the day at the Magnificent Sunrise Beach and then treat you and your family to an unforgettable night out at the Magic Dancing Waters Live Show. 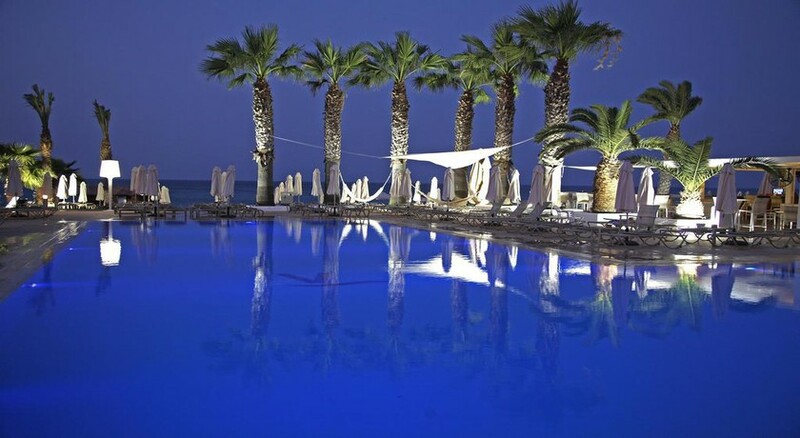 Vrissiana Beach Hotel is set within the beautiful surrounds of the Protaras region of Cyprus on the west side of the island. 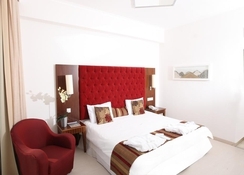 The nearest airport, Larnaca International Airport, is just 65km from the hotel. Guests here will have immediate access to Sunrise Beach and Pernera Beach, located as it is, right on the beachfront. Its location along the Protara road also means that many restaurants and bars are easy to walk to. Incredible family entertainment can be had at the not to be missed Magic Dancing Waters Live Show just a five-minute walk away. Retail, food and souvenir shopping are also all quick and easy to access. 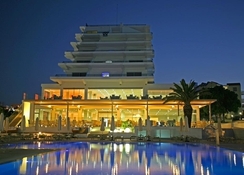 Vrissiana Beach Hotel comprises 136 rooms all of which are elegantly designed with a careful balancing of the colours, furniture and appointment of their features. A room here will feature a comprehensive set of standard amenities such as air-conditioning, wi-fi, T.V., telephone, safe deposit box, tea and coffee making facilities, private bathroom and more. There are a number of room types. Standard rooms sleep up to three guests with a double bed and extra cot available on request and offer a variety of stunning views, from the Mediterranean Sea to lush gardens. There are also several extra special suites, the Princess, Queen, King and Presidential provide guests with a luxury stay, typically include a larger sitting area which is separated from the bedroom. The main restaurant offers delicious a la carte menu of Mexican cuisine. 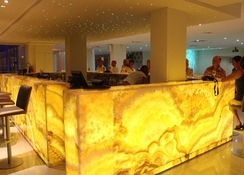 There is also a buffet restaurant and four bars serving a fine selection of drinks and snacks. 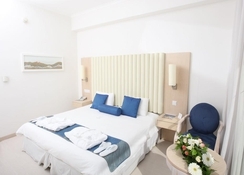 Away from Vrissiana Beach Hotel, guests will be bound to find something to suit their tastes with many restaurant choices within easy walking distance. If you fancy Italian, check out Marcello’s Restaurant, a couple of minutes walk down Protara road. Andama Tavern offers a taste of authentic local Greek and Cypriot cuisine and great seafood at Di Capilla. In addition, there are also bars combining delicious drinks with views over the Mediterranean Sea. A stroll in either direction from Vrissiana Beach Hotel and you’ll hit Fools and Horses Pub, Nicolas Tavern and Steens Bar & Grill. Guests at Vrissiana Beach Hotel will have access to an outdoor swimming pool, sun loungers and sun terrace and there is also a paddling pool for children as well as a playground. Stay active at the gym or grab a racket and hit the tennis court. 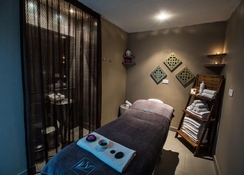 Alternatively, you may just want to unwind with a deep massage or a revitalising sauna at the spa. Soak up the Cypriot sun on Sunrise Beach or get up early enough to discover this beach’s namesake. A trip one evening to the Magic Dancing Waters Live Show should also be on your list of things to do as adults and children alike will be captivated throughout.